edited by Campbell Price, Roger Forshaw et al. It is granted to few people to follow a childhood dream and then, through perseverance and dedication, not only achieve it but also to rise to international recognition in achieving that dream – Professor Emerita Rosalie David, OBE (and AE Consultant Editor!) is one such person. As a six-year- old inspired at primary school by seeing a reconstruction drawing of the Abusir pyramids Rosalie told her parents that she wanted a life devoted to Egyptology and was 19 when she first visited Egypt – the rest, as they say, is history. Her studies led her towards investigation of mummies and the many aspects associated with them and the consequence was her founding the Manchester Museum Mummy Project, followed by the KNH Centre for Biomedical Egyptology at Manchester – small wonder that the Preface in this festschrift, on the occasion of her 70th birthday, sends best wishes to the ‘Mummy Lady’. Dr Campbell Price, with a five-strong editorial team, has brought together an incredible array of Egyptologists and associated scholars to salute Rosalie in a series of 36 contributions in her honour, many of the writers noting their particular reasons to be grateful in many ways to Rosalie in their careers. The ‘multidisciplinary’ in the subtitle is reflected in the four sections into which the papers here are divided: I Pharaonic sacred landscapes (7 contributions); II Magico-medical practises in ancient Egypt (10); III Understanding Egyptian mummies (11), and IV Science and experimental approaches to Egyptology (8). With such a plethora of papers it is extremely difficult to select any individual presentations. The real value in this selection lies in the care with which the four sections were identified and the consideration shown in selecting papers for their relevant inclusion and contribution to the overall presentation of the book. This collection is not like the proverbial curate’s egg, ‘good in parts’, it is good in every part. Obviously readers will initially home in on their own particular interests or expertise, but the delight thereafter is in delving, often into areas which so often an academic will say is ‘not quite my field’, but in all these papers with no exceptions there is information, facts, often re-interpretations and succinct updates on research written with warmth in their dedication to Rosalie. The Arab proverb runs that ‘Perfection is unto Allah, to achieve perfection is blasphemous’. This festschrift, in the reviewer’s eyes, only falls short on three editorial issues. 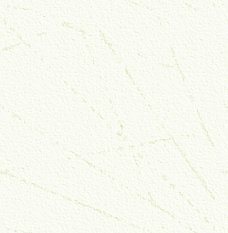 Firstly there is no bibliography of Rosalie’s publications, although there are frequent citations of these in the references appended to each paper. Secondly as this is a large book (with 512 pages, 109 figures, 25 tables and 17 colour plates) a short indicative index, possibly only of place names and broad object topics would have been helpful, as would the addition of page references and name credits in the captions to the (excellent quality) plates as there is no easy way back from the colour plates for the reader to the relevant text. 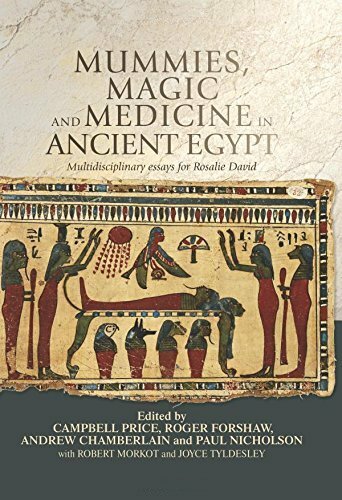 Despite these three caveats, there can be no doubt that this festschrift is not only a marvellous acknowledgment of Rosalie David’s major contribution to Egyptology, especially in areas that had previously not been properly addressed, it should be on every amateur and professional’s bookshelf, and it is published at an extremely reasonable price in view of the high quality of its academic contents and its production. Statues are often taken for granted and viewed with a modern bias about the nature of art. In fact, the original context of statues – and interactions with them – is likely to have been rather different from our expectations. 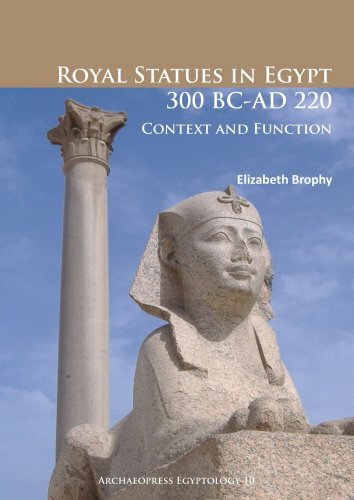 Elizabeth Brophy’s book charts the evidence for Graeco-Roman royal sculpture in ancient Egypt and provides some interesting insights into original intentions. The book examines the (albeit limited) mentions of royal statues in texts, Greek and Egyptian, and evidence for cult statues of both gods and deified royalty (including the Imperial cult of Roman Emperors). Brophy also discusses evidence for categories of statues (a complex issue!) and sacred and domestic contexts. Inevitably a work of this type uses a great deal of evidence from Alexandria, as the chief city of the Ptolemies and Romans, and usefully contrasts this material with statues from outside Egypt – in Meroë a major centre to the south of Egypt, and in Italy. The author provides a useful catalogue of items discussed and it is clear that this has arisen from doctoral research on which the book is based. Even for the more general interest reader this is a helpful itemised list of statues (most with black-and-white illustrations) that might be considered for further in A book such as this provides a welcome overview of its subject as well as presenting the specific range of evidence that might be used when studying such an evocative category of objections as royal sculpture. Well known pieces such as the Rosetta Stone and Bronze Head of Augustus (both in the British Museum), as well as the towering granite colossi of a Ptolemaic king and queen from Alexandria (familiar to anyone who has visited the current BM Sunken Cities exhibition – see page 22), each contribute to our understandings. Royal statues were clearly created to fit contexts appropriate to both the Egyptian, Greek and Roman worlds – and the multicultural setting of these considerations will be of interest to most Egyptophiles. Paperback, £38 (also available as an ebook, £19). Win a copy of this book in our photo competition on page 64! Bees have been a vital resource to human beings since the earliest times when honey was collected in the wild. 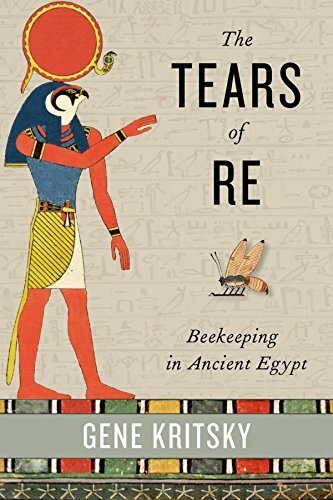 This fascinating study, only 124 pages long, traces the history of beekeeping and honey production through pictorial evidence starting back in the Fifth Dynasty. Pharaoh Newoserre Any (also known as Nyuserra Ini) had fine reliefs carved on the walls of his sun temple. Though badly damaged, these show hives and beekeepers in action, from ‘calling the queen’ to see whether the bees are about to swarm through to the processing and potting-up of the product. The author, himself a beekeeper, presents a chronological survey of the evidence, using inscriptions which include references to overseers of the beekeepers. Depictions include the Old Kingdom reliefs on the Unas causeway showing the collection of honey, a relief in the temple of Senusret III from the Middle Kingdom and many examples of bee-related pictures in New Kingdom tombs. He includes a discussion of whether the tubular hive in the Manchester Museum (which certainly has traces of bee activity in it) was actually a working hive or rather a container for honey. The Theban tombs contain many references to honey production and its importance. The practice of offering incense to hives of bees, recognising their divine importance, is shown frequently and may have resulted in the accidental discovery of the efficacy of using smoke to calm down a swarm of bees, which is routinely applied today. There are also New Kingdom pictures of honeycomb being used as offerings and even examples of honey being used as payment. Further chapters deal with the uses of beeswax, including manufacture of wax shabtis and masks, and the production of encaustic portraits in the Ptolemaic Period. A whole chapter is devoted to the hieroglyphs which represent bees. Examples of different versions are illustrated with a discussion of their various uses. Honey of course formed an important part of the diet, but also had a major role in medicine and the treatment of disease. Conditions treated by honey mixed with various other substances include gynaecological and urinary problems, open wounds, bites, eye problems, dental pain, coughs, and dealing with parasites. Honey was linked to religious practices and often named ‘the tears of Re’ but other deities such as Neith, Nut, Min and Hathor were also associated with honey. In the final chapter the author draws on his own experience as a beekeeper to discuss later and more modern methods of beekeeping. He also points out that in Egypt traditional methods are still being used. Do not be put off by the apparently specialised nature of this book. It is well researched and very accessible to the general reader. EES Excavation Memoir 108 by Janine Bourriau and Carla Gallorini. Archaeologist Augustus Pitt Rivers once said: “The value of relics, viewed as evidence, may be said to be in inverse ratio to their intrinsic value.” So, whilst we may all marvel at the gold and silver treasures in museum cases, it is the stuff and rubbish from the dark corners of everyday life that can tell us more about the lives of the people of past civilisations. Pottery, in the form of complete pots and potsherds, is often one of the most common finds on archaeological sites, and has many advantages for the excavator and for site interpretation over other finds, even in an archaeologically rich society such as ancient Egypt. The Egyptian Exploration Society has been digging in Memphis since 1982 and has published a number of excavation memoirs about the site. This latest volume, the eighth in the series, concerns itself with the Middle Kingdom and Second Intermediate Period pottery from a small section of the excavations which took place in 1987-1988 and 1990. Although the area worked covered less than twenty five metres by ten, nonetheless the richness and diversity of the ceramics found has meant that the pottery had to be sampled to provide a meaningful analysis. This excavation memoir of the site presents a classification of the pottery found at the site with black-and-white images of the various pottery types, with separate chapters on the various fabrics (that is, the types of clays and their inclusions), pottery marks (marks scratched into pottery by fingernails or pointed implements, before or after the pottery was fired) and detailed descriptions and commentaries of the pottery found in each of seven Corpus sections of the excavation area. Each chapter is illustrated with copious distribution charts and completed by a set of archaeological pottery drawings depicting the forms and designs of the various types of pot found in the contexts. There is also a discussion on ‘fish dishes’ (oval dishes, sometimes with a raised platform in the middle, and decorated with incised patterns, or images, of fishes or fish nets) and two chapters about pottery that could be considered ‘exotic’ to Memphis, in that it originated in Nubia, or Crete and Cyprus. The volume also includes a CD-ROM that includes three appendix tables of various pottery occurrences from the site. The one criticism I would make is that although there is a plan of the excavation at the beginning, there is no scale included and no readily obvious reference in the text to the full extent of the excavation. Clearly, this volume is intended by its authors to be used as part of a set of memoirs about the site and not to be used in isolation, which is a pity, since the pottery identification information by itself would be suitable as a stand-alone aide-memoire and field guide to any ceramicist who encounters Middle Kingdom pottery in the field. 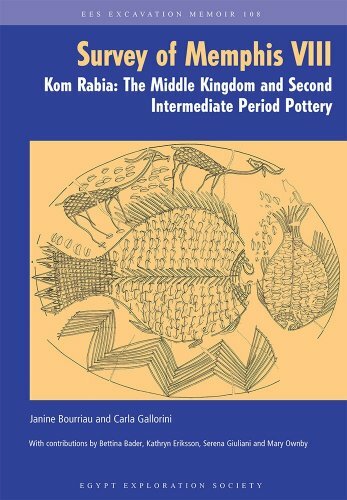 But on the whole this is a good compendium of the pottery from Kom Rabia for anyone with an interest in the ceramics of ancient Egypt. One of my favourite pastimes is to browse second-hand bookshops, car boot sales and online marketplaces to find and marvel at Egyptological treasures: antiquarian books, postcards and photographs of a bygone age in Egypt and the Near East. Rachel Mairs struck gold in an eBay search when she discovered a scrapbook of papers entitled Testimonial Book of Dragoman Solomon N. Negima. This collection contained letters of recommendation for Solomon Negima’s work as a dragoman (tourist guide and interpreter) in the Near East during the late nineteenth and early twentieth centuries, and the timing was especially fortuitous as Mairs and Muratov were in the process of writing a book about dragomans in nineteenth century Egypt and the Middle East [reviewed in AE93]. This treasure trove of personal endorsements, from tourists of different nationalities, religions and social classes, tell a story of a remarkable life. 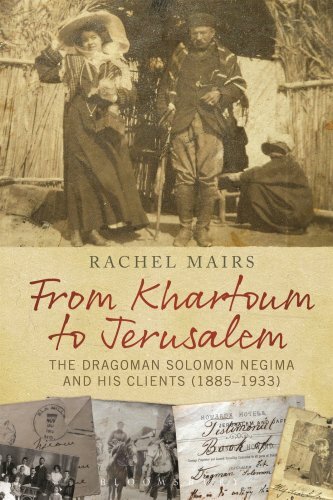 Solomon Negima, a Syrian, travelled and worked as a dragoman across Jerusalem, Sudan, Syria and Palestine, at a time of unprecedented social and political change when the world was becoming more cosmopolitan. With the advent of the package holiday, travel became cheaper and more accessible than ever before, and Negima’s client profile reflects a growing middle class, increasing freedom for women and the new position of African-Americans after the abolition of slavery. What is so interesting about this scrapbook of letters is that the voices are those of Negima’s clients, but it was Solomon himself who brought the collection together as a testimonial book for public display, to give prospective customers an idea of his character and accomplishments. One example is of H. Milner Black, a minister from London who, after his visit to the Holy Land in 1891, wrote that Negima ‘fulfilled his duties to [Black’s] entire satisfaction’. The voices of dragomen in Egypt and the Near East – men who were often multi-lingual and highly intelligent – have for the most part been lost to history. In this fascinating book however, we have an opportunity to not only learn more about an individual dragoman, but also further details of a profession fundamental to the success of the ‘grand tour’ which would otherwise have been consigned to an unknown fate. The book is well-illustrated with copies of several of the letters themselves, along with supporting images of characters and events mentioned in the scrapbook to contextualise further the discussion. I for one will not only consider the multi-faceted work of dragomans in a new light after reading this book, but will certainly be searching with greater detail in those second-hand shops in the hope of a similar future discovery! Hardback, £65 (also available as an ebook, £65). The Red Monastery at Sohag was built in the latter part of the 5th century and was part of a federation together with the larger White Monastery and a now lost women’s complex. It continued in use as a monastery until at least the fourteenth century and then ceased as a monastic foundation, though a Coptic community with church and priest continued there. The architecture of the sanctuary is a distinctive tri-lobe space, like a three leaf clover. Restoration of the fabric of the church was completed in 1909 but from 2002-12 conservation work has been undertaken on all the fifth - sixth century and mediaeval wall paintings. They had been totally obscured by the accumulation of centuries of grime and no one realised just how important they were. This book is edited by the project director and tells the full story of this neglected masterpiece. The book is divided into three sections. The first explores the origins and social setting of the monastery in the late Roman to Byzantine periods. The second concentrates on the wall paintings themselves, executed in four periods within less than a hundred years. The third tells the story of the last one thousand years, the decline and eventual restoration to what is once again a functioning Coptic monastery. Each of the twenty chapters is written by an expert in their field. The book is lavishly produced with 259 colour and 70 black and white illustrations. 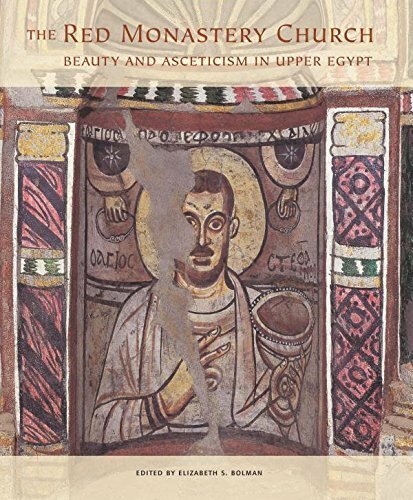 It will be welcomed both by those interested in Coptic studies and in art history more generally. The restoration work is stunning and has opened an entirely new light on this neglected period of Egyptian religion and culture. I would recommend this book wholeheartedly to AE readers who want to explore beyond the world of the pharaohs to another creative period of Egyptian history. 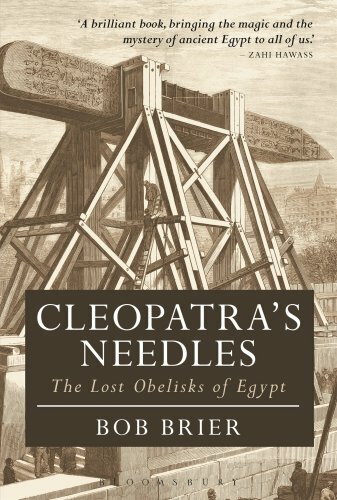 There have been many books written about the obelisks of Egypt, but this work contains much fascinating and obscure detail that makes for an entertaining and informative read. Written for a lay readership with no prior knowledge of Egyptology, it begins with much basic information which will be ‘old hat’ to AE readers, such as the unification of the two kingdoms, the development of the pyramid and the quarrying, transport and erection of obelisks. A long section of the book then describes many of the obelisks that were transported to Rome by the Romans, starting with the Piazza del Populo obelisk erected by Augustus around AD 10 and ending with the Monte Picano obelisk erected by Hadrian to commemorate his lover Antinous. For the most part the obelisks were toppled and lost, but re-erected in later centuries and turned into Christian monuments by successive popes. Also described (unusually) is the last obelisk to be moved by a Roman emperor, which came from Karnak and was ultimately erected, minus its bottom third, by Theodosius (AD 347-95) in what is now Istanbul. The chapter “God’s Architect” then describes the chequered history of the Vatican obelisk, the only one without a hieroglyphic inscription, which was brought to Rome by Caligula and erected in a horse-racing circus on a bronze pedestal, where it remained for 1,500 years. Pope Sixtus V decided to have it moved to St Peter’s Square and appointed a young architect, Domenico Fontana (God’s architect), to undertake the task, which he completed in less than a year in 1586. The remainder of the book deals with the transportation and erection of three obelisks in more recent times: one of the Luxor temple obelisks in the Place de la Concorde in Paris, and two obelisks from Alexandria, one in London (‘Cleopatra’s Needle’ on the Thames Embankment) and one in New York’s Central Park. It is here that the book scores by including a mass of fascinating detail regarding the selection of the monuments, the negotiations needed to obtain their release from Egypt, the extraordinarily difficult and dangerous task of transporting them, which cost several lives, and the immense engineering feat of re-erecting them. This attractive, large-format book, is extremely eye-catching and deserves attention from anyone interested in the history of the Mediterranean. The Editor is one of the world’s leading authorities on the subject, and the team of scholars he has assembled discusses the Mediterranean from a number of different perspectives. 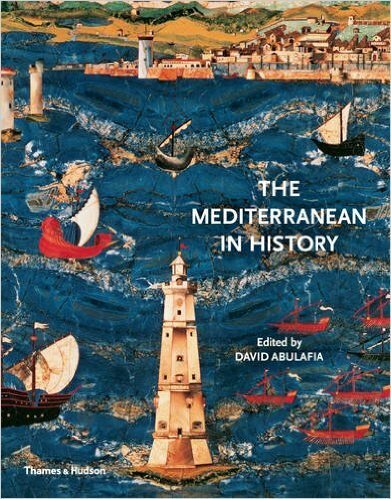 Although the chapters are based on a loose historical format, from prehistory to the year 2000, the book considers the Mediterranean as the meeting place of nations; it considers the power battles that have taken place for control of the sea, and the impact that different religions and cultures have had upon the region. One of the main points of interest to the Egyptologist is the discussion on the origins and fall of the ‘Sea Peoples’. There are also snippets of surprising and often overlooked information, such as the fact that, due to the opening of the Suez Canal, fish from the Indian Ocean can now be found in the Mediterranean itself, a detail which shows how the sea is still reacting to modern changes. It seems a pity that the publication seems to come to a sudden halt in the year 2000. A revised edition bringing us more up-to-date would have been far preferable to just republishing the 2003 edition in paperback; one turns the page wishing that it could have devoted a least a few final words looking forward instead of back, summing up the potential for the Mediterranean and the problems that it still has to overcome as the world develops in the twenty-first century.